A protester faces police officers on Sunday in Milwaukee, during a protest held for Sylville Smith, who was shot and killed by a police officer as he reportedly attempted to flee during a traffic stop Saturday afternoon. 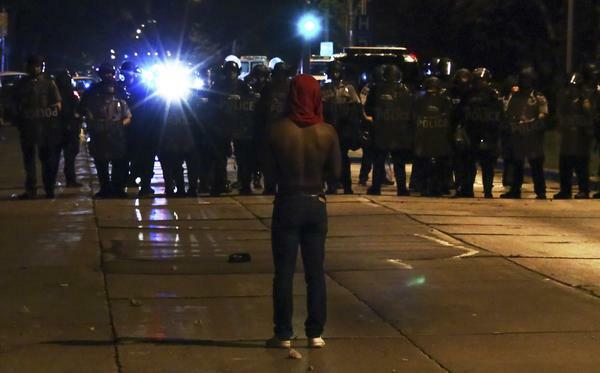 Milwaukee saw a second night of unrest on Sunday following a fatal police shooting this weekend. Sunday's protests were smaller and less destructive than the previous night's, although some violence continued and one person was shot and wounded under unknown circumstances. The weekend's demonstrations and rioting were prompted by the police killing of a 23-year-old black man, identified by police as Sylville Smith, on Saturday. Smith ran from police during a traffic stop. Police say he was carrying a gun. Police Chief Edward Flynn has not identified the officer who shot Smith, but says the officer is black, The Associated Press reports. Police say Smith had been arrested 13 times before, Chuck Quirmbach of Wisconsin Public Radio reports. The Wisconsin Justice Department is reviewing the shooting. As we reported, the protests immediately after the shooting were destructive and volatile. Six businesses were set on fire, 17 people were arrested and four police were injured on Saturday, NPR's David Schaper reports. Protests on Sunday were "not nearly as large nor as violent," David says. The AP reports there were some people throwing rocks and construction barriers. Little is known about the one person who was shot at a protest Sunday evening; police retrieved that victim in an armored vehicle and took him or her to the hospital. "There were no other reports of injuries and no major destruction of property," the AP writes. NPR's Cheryl Corley reports that authorities are waiting for Smith's autopsy results, and body camera footage of the shooting has not been released to the public. Meanwhile, the National Guard is on standby if Milwaukee authorities say they need help. "In the park not far from where Sylville Smith lost his life, dozens of people gathered earlier in the day for a prayer vigil — and to clean the debris around the gas station that was destroyed Saturday night. An odor of smoke still lingers. "In a way, it's a long-standing problem for Milwaukee. Two years ago, the city was rocked by months of protests after an officer shot an killed Dontre Hamilton, a mentally ill black man. In December, the U.S. Justice Department announced that it would work with Milwaukee police on reforms." People who live near Sherman Park on Milwaukee’s north side spent Sunday cleaning up, after violence erupted Saturday night. Demonstrators damaged property and started fires, after a police officer shot and killed a man. Police say 23-year-old Sylville Smith was holding a gun when fleeing a traffic stop. Some neighbors brought brooms and garbage bags while others gaped at the building that used to house the BP station. It was incinerated with glass everywhere and the smell of smoke permeating the air. At a press conference Monday, Mayor Tom Barrett announced that the existing 10 p.m. weekday curfew for minors will be more strictly enforced. Milwaukee County Sheriff David Clarke has also ordered Sherman Park to close to the public at 6 p.m. Monday night. It will reopen at 6 a.m. on Tuesday. Clarke announced that the nighttime park closure will continue until further notice. People angry about the fatal police shooting of an African American man in Milwaukee took to the streets again overnight Sunday. If Milwaukee were not reeling after a weekend of violence and a young man’s death, a peaceful Sunday afternoon soccer game on the city’s south side would have seemed perfectly normal. A group, called Common Ground, gathered at the Kinnickinnic Sports Center too, to push for more recreational opportunities for Milwaukee kids. The group believes the move could help make violent weekends rare. For updates, follow @WUWMradio on Twitter or this post from Monday. Milwaukee Mayor Tom Barrett and Milwaukee Police Chief Edward Flynn held a news conference Sunday afternoon to share details about the investigation into Saturday's events. Barrett said there is a photo that shows "without a question" that the African American man who was fatally shot by police was holding a gun. Violence and protests broke out in Milwaukee Saturday night. A police-involved shooting on the city’s north side aggravated what had already been strained relations between some members of Milwaukee's black community and local police.